Somehow this needs to be organized. I have no idea how, but some sort of spreadsheet with the frames sorted by size? I need to measure, but I have several frames worth trading. Agreed. Maybe we should think of this thread as a trial balloon, to see how much interest there is. I'd say, at this point, interest is good. But a lot of the above posts --maybe including my own-- share too much information. If you want to trade a 23" frame for a 25", this is your thread. If you want to trade a Raleigh International for another Raleigh International and nothing else will do, then maybe this isn't for you. I'd like to trade my Japanese Bianchi for a 1947 Claud Butler in 24" frame, but I know that's unrealistic. I'd gladly trade it for any road bike frame in 24" with horizontal dropouts. I like the idea of a spreadsheet, but don't have the savvy for that. Volunteers? We could do a google document. What information do we need on it? Effective TT and ST meaurements, maybe description to give a rough idea of worth (frame materials, condition, and such), and then an ISO description? A = full / butted molybdenum-alloy steel --don't bother saying whether 531, Columbus, Tange, or what. B = partial / straight gauge molybdenum-alloy steel -- again, don't bother with the details. C = hi tensile steel. D = anything other than steel. If you're getting rid of a frame that requires unusual parts, non-English BB and headset, unusual sized FD or whatever, I suggest you include it if you can. Other information required: dropouts, eyelets, other brazed on fittings. Damage should be clearly stated. What else, guys? As I said before, this thread is probably just a trial balloon. What rules would you like to see? Under what terms would you, or would you not, play this game? I have a NOS Schwinn Super Sport LE road bike frame, size "L", which I would guess is like a 59-60cm. Slightly sloped top tube, replaceable der hanger (I have the correct one) never built up. Never been able to find anything out about this frame (including from Schwinn and the shop that sold it to me) other than it was from a line of frames they sold several years ago only to LBS, not to dept. stores. Headbadge and seat tube badge, made in China, aluminum, and now you know as much as I do. Cable stops at the upper end of the DT, 130 spacing. Black and silver and in storage, so no pics immediately at hand. Have an (also new) SE fork to go along with it, fork is root beer colored but the threadless stem is long enough to work with the frame, which requires an integrated headset. I suspect this would make a pretty nice bike once built up but would require STI's or thumbies or bar ends. Also have a 1990 Cannondale M400, red, with the correct fork. At least I'm pretty sure that's what it is. Needs a respray/powder coat but appears dent free and straight. Would make a nice tourer or use it for a 'cross bike. It's a shortie- with 700C wheels it would build up to about 54cm. Takes V-brakes or cantilevers or whatever else fits on those stubs that are welded/brazed to the seat stays and front fork. 130mm spacing. Also in storage but can dig it out and post pics for anyone who might be interested. Bought both of these when I was feeling pretty frisky and experimental, but have since realized I'm strictly a DT shifter/road bike/caliper brake kinda guy. Will trade one (or preferably both) for any reasonable frame 58cm or smaller in dent-free condition. This is getting too much like work. SOMEBODY has to both a) want these frames, and 2) have something to swap for them. Anything as long as it's not made for Some Giant Person. Seems like everyone who wants to buy a bike from me these days is the size of eeekamouse. Heck, to sweeten the deal I'll throw in a full Suntour Alpha3000 setup (FD/RD/DT Shifters/Freewheel) with the Cannondale frame. Indexed, solid and kinda sporty looking. Otherwise both frames will wind up going to the local Bike Co-Op & I'll just take the tax deduction. Last edited by rccardr; 12-27-10 at 12:44 PM. I'll play...I think I have some frames that are too big for me, was going to try to flip these or solicit trades on CL. They are nothing exotic. Just some specific era frames good to someone tall or needs large flippers. First one: '79 Ross Pro Grand Tour. 62cm. Posted initially in the 'saved' thread. I'll take a similar spec road frame in my size (55-57cm c-t). It's for a SS/fixie project. Can take 27" or 700C wheels as I have both as spares. Second: '95 Cannondale M300 LE MTB in black. Large 22" rigid hardtail. 1" threaded unicrown Spinner fork. Small dent underneath rear monostay, hard to see actually. It's paint is fair. Series 3.8, made in the USA. I was going to make it a drop bar tourer/utility project, but it's awfully high for my 30" inseam. I will trade for a similar aged or older, smaller Cannondale mtb or road frame. 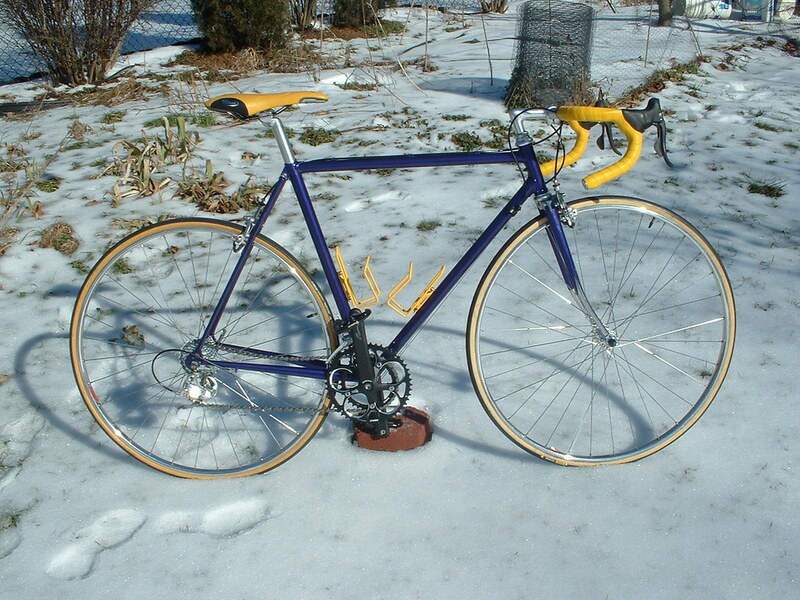 Third: '80 Ross Diamond Cruiser frameset, in gray/blue. Large frame. Kinda like a city MTB than outright cruiser. Comes with headset, bull moose SR stem and seatpost. Fair condition. Will trade for a more traditional cruiser style frameset. 19" 1992 Trek 1200. A little small for me. I have this repainted (Dr. Deltron) 1984 Trek 760 frame that I would be happy to see go somewhere it would get more use. It's 54cm ctc in the seat tube, 53cm ctc in the top tube. Lugged 531P Reynolds tubing. The paint is rich purple and in outstanding condition, fork ends are chrome. The frame was pretty much a top-of-the-line crit geometry frame when it was made. My Bob Jackson, and Raleigh Team Pro make this effectively redundant in my stable. Would be willing to include the current (I believe original) Stronglight, A-9 needle bearing headset for the right exchange. I'd be looking for something with at least butted tubing, in 55 - 58 cm size range. Would prefer sport touring, or touring geometry. Willing to consider older frame that's sound, and not in great finish, so don't be shy about proposing a trade. 15" 1988 Giant Iguana. This thing is really tiny, super short front/center. I have toe overlap with my dainty size 8 shoes. More pics available by clicking on the pic, then clicking on the "Older" button. I'd gladly trade it for any road bike frame in 24" with horizontal dropouts. So, in keeping with the BOC theme, this is more about: here's my crappy frame in the wrong size which I'll gladly trade for your crappy frame in my size? And I'm willing to pay $50 for the transaction. On the subject of order, do bicycle swap meets hand out spreadsheets to shoppers? I would thinking digging through the thread is appropriate when trading crappy frames. Personally, I have a few frames to offer, but none I'd consider crappy. Unfortunately, my interest is very narrow, so I'll keep my eye on the thread. Doesn't seem to be for crappy frames, just frames that don't work for you. Personally, I like to see the details of the frames up for trade. I think you read something into this that wasn't there. I think it's because the idea was originally conceived in the BOC thread...understandable. That could be the case. I didn't intend to suggest the frames listed in this thread are crappy, I'm just curious about RHM's original intent. My original post was inartfully executed. And for the record, there's nothing wrong with crappy frames. Wouldn't think it would work very well unless local. Shipping is a PITA-(maybe not for just a frameset) but for bikes already together. I like the swap idea-just right for giant peeps swapping with wee peeps. Guess I'll see what evolves. Shipping a frame is $25-$40, depending on size and location. I agree. Completely understandable to skim to that conclusion. JYB - I definitely understand. Wasn't trying to do a gotcha, but I'd prefer to see this not limited in that way - unless rhm makes that clarification. Well, speaking for myself alone... yes, that sounds about right. That is, I'm willing to pay shipping my frame to you. JYB, we ride the same frame size which pretty much excludes us from doing this kind of business together, except that we have pretty radically different taste in bikes, so maybe there's hope after all, but then again I pretty much only have crappy ones and you pretty much only have nice ones, so... uh, never mind. My hope with this thread is that we consider passing our useless goods ("crap") on without worrying too much about what we get in return, so long as it fits. The frame I have is, for my purposes useless ("crap") because it's too (a) small (b) racy and (c) modern. Something in my size would be far more useful. If it's still crap, at least it would be crap in my size. It's not a terrible frame. It's really quite nice, it's just useless to me. I'm not a gambler, and I recommend anyone playing this game understand what they're getting. But inasmuchas the BOCPAG was gambling, and the secret Santa game was gambling, this too is gambling. You put something in, and you get something out. No one promises that what you get out is more valuable than what you put in. Anyway, I started this thread, and will follow it, but I'm not making up the rules. I'm merely suggesting rules I'd like. Make your own rules, arrange your own trades, and make someone happy. If anyone's happy, I'll be happy. And if I get a 60 cm Claud Butler (or Holdsworth, Carlton, Hetchins, Norman, &c), I'll be especially happy! Yes, John, you have it right. This isn't to be limited in any way. It's a free-for-all! Anyone who wants to organize it, categorize it, and make it work, please! Be my guest! I have several I would be willing to trade for something comparable 53-54cm. I think we might all have different versions of the game that we expect. On one end the game basically just becomes "ISO/FT for frames that don't fit". I'd prefer more of what you're saying - a game to get a frame you can use. Toss a frame you have that doesn't fit you, and get one that does that's roughly the same value. 1987 or so Novara Triforma or something like that, 56cm Tange No.1 lugged frame, nice. 1992 or so Trek 710 or so hybrid frame (700C MTB commuter), 18-19 inches I think. A pile of others. What are you looking for. Last edited by balindamood; 02-20-11 at 01:16 PM.